Search engine optimization (SEO) is a cost-effective way to maintain and promote your brand’s online presence. A clearly defined strategy is key to staying on top of the competition in the search rankings. We’ve known for at least 18 months now that ‘mobile friendliness’ is an important factor in determining how well your site will rank on SERPs in response to a keyword query. As such, ‘mobile responsive’ websites have become the catch-cry of many web developers. But what does it all actually mean? Towards the end of 2016, Google officially announced its mobile-first indexing update, which will become the main focus of 2017. This announcement heralded the start of big things to come in relation to mobile search. Sounds easy, right? It can take a little work to satisfy Google’s new mobile-first indexing strategy. But the effort will pay off as Google ramps up its commitment to use the mobile version of a site when indexing for search. While you’re in the process of upgrading your mobile site to satisfy Google, take some time to enhance the user experience (UX). You should consider serving content to users via AMP or leveraging progressive web apps to increase conversion rates and engagement levels. Finally, just as content is king on desktop, content on a mobile site is critical to search visibility on Google. If used appropriately, expandable content shouldn’t impact visibility. If you’re not sure how well your site will perform on a mobile device, check out Google’s great free mobile usability testing tool. Google is getting better at identifying user intent – that is, what a person intends or wants when they type their keywords into the search engine. Do they want to do something, like buy a pair of shoes? 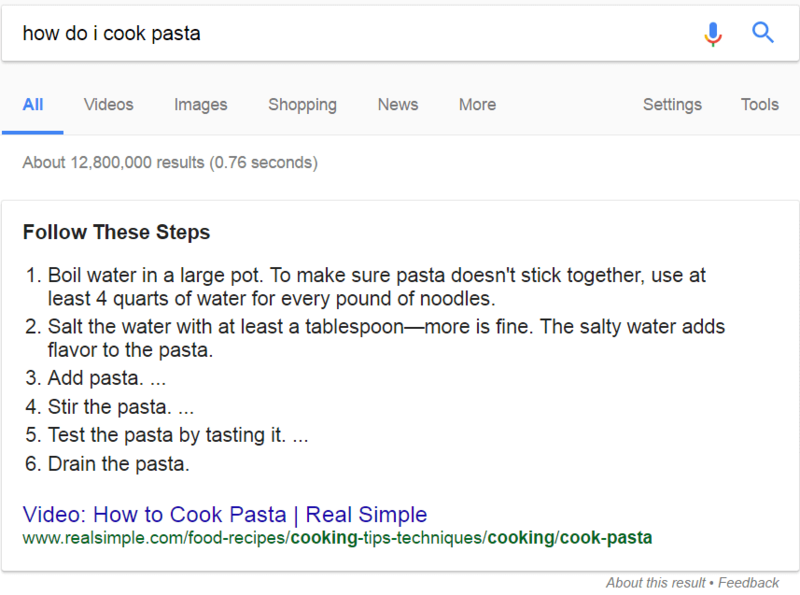 Find out something, like how to cook pasta? Or go somewhere, like a travel blog? Increasingly, users are now entering direct questions and more long-tail conversational queries in search engines. Google is reacting to this change in user search behavior by tapping into its knowledge graph and displaying results in SERPs using snippets such as Featured Answers, List Snippets, and Table Snippets. Featured snippets are the highly-visible text snippets that appear at the top of the search results page. Because they jump above the top of the organic results (essentially taking position #0) and capture the majority of user click-through, they are highly valuable to marketers. Google has programmatically extracted this snippet from the www.realsimple.com website, providing a direct answer to the searcher’s query. In 2016, we saw a big rise in the number of these featured snippets being displayed directly to users. This year and beyond, Google will display more and more variations of these answer formats to users. Review site content and identify opportunities to optimize based on user questions and intent rather than specific keywords. Conducting user surveys and creating searcher personas are key. Make the most of user micro-moments by identifying user questions with keyword research and strategically publish content to meet this demand. Voice search has been around for a few years now. Ask anyone with an iOS smartphone, and you can be certain they’ve made friends with Siri. With technology improving and the likes of Google Home and Amazon Echo making their way into more people’s living rooms, voice search is now the fastest-growing type of search. By 2020, it is predicted that half of all searches will be done by voice (comScore). Voice search changes the way we determine keywords, shifting the focus towards location-based, personalized content. Given this, long-tailed keyword phrases are more important than ever. You can use these tools to frame a content strategy that is more closely aligned to the intent of today’s web users. Smart marketers are already tapping the trends of mobile-first indexing, optimizing for user intent and voice search. While it can require a re-jig of your current SEO or content strategies, the effort will pay off as your site rises to the top of the SERP rankings and you enjoy much higher click-through rates. And what happens if you do nothing? If your site is not mobile responsive, and the content and markup is not identical across desktop and mobile, Google will slowly but surely overlook your content. If your site’s content is not structured for featured snippets, then you will lose out to those that are. Likewise, if you’re not thinking about voice search and how people are now making search queries, then your competitors’ content will come first. Doing nothing could end up costing you more than making some simple changes to your site’s content. Question is, what is a high ranking on Google worth to your brand and business? If you have any questions about the above trends, or want to learn more about how to keep pace with the changes in the SEO landscape, contact Performics today.